Circa 1920. Stay at this romantic, adults-only Colonial Revival mansion for a truly luxurious setting in the Finger Lakes region of Auburn, New York. Elegant and fully restored to preserve its character while adding amenities, the spacious yet intimate ambiance reflects upscale boutique accommodations in a quiet neighborhood amid the historic district. Relax in the expansive back yard with perennial gardens, screened-in gazebo, koi ponds and waterfalls. Sitting rooms include the library, formal living room and sunroom. Guest suites are professionally decorated with designer fabrics, original artwork, a mix of antiques, modern and handcrafted furnishings, fireplaces, premium spa bedding, European rain showers and Jacuzzi tubs. Breakfast is served daily in the dining room, or order room service in advance. Explore Owasco Lake and nearby wineries from this central location between Syracuse and Rochester. Payment Types Accepted Include American Express, Travelers Checks, Visa, Master Card, Discover and Cash. This property has 3 total guest accommodations, 3 with fireplaces, 1 with whirlpool, 3 suites. The types of beds available include Twin, Queen and King. Decor is luxurious and elegant, crystal chandeliers, silk, velvet, candlelight, 7 fireplaces, decadent sheeting and custom bedding. Innkeepers love to spoil the guests and often leave romantic little touches at turn down for them to discover when they return from dinner. Since the inn specializes in being a romantic escape for guests, 10 Fitch is not an appropriate place for small children. Skaneateles Chamber of Commerce, Cayuga Chamber of Commerce, Cayuga Wine Trail, PAII, New York State Hospitality & Tourism Association, Finger Lakes B&B Assn. Formal perennial beds blanket the outside of the home. A secret garden designed in the early 1920's by a Cornell landscape architect is located at the rear of the property and has been updated with new stone work, a large Koi pond with waterfall, patio area & screened in Gazebo. A smaller Koi pond is located off the Veranda/deck close to the house. Exquisitely decorated in custom Ralph Lauren wall coverings, draperies & decadent bedding this three-room suite features private bath with Jacuzzi tub, separate marble rainshower, spacious sitting room with gas-log fireplace. Three room suite that overlooks gardens. 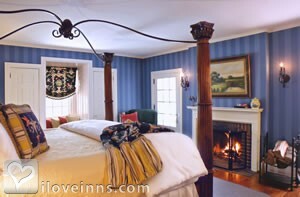 Features electric fireplace, Queen bed, lush bedding and antiques. 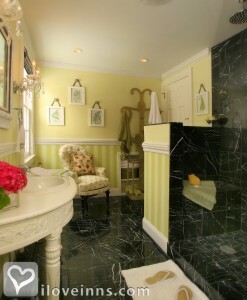 Private bath features a walk-in marble rain shower, luxurious robes & towels. Large 3-room suite decorated in designer fabrics and silks featuring bedroom with fireplace, cozy window seat and private deck overlooking gardens. Bathroom has large clawfoot soaking tub and European rain shower. Separate sitting room with plasma television and pull-out sofa for additional sleeping area. Reservations of only one room: At the time of booking a deposit is required equal to 50% of the total charge. This deposit is refundable less a $25 processing fee per room when given at least 30 days notice of cancellation. If less than 30 days but more than 14 is given, a gift certificate in the amount of the deposit will be issued and may be used toward another visit within 12 months, restrictions may apply. If less than 14 days is given then the deposit is forfeited and balance remaining will also be required unless the rooms can be re-booked. Deposits for all holidays are non refundable, including but not limited to: New Year's, Valentine's Day Weekend, Memorial Week, July 4th Week, Labor Day Weekend, Columbus Day Weekend, Thanksgiving Weekend and Christmas Weekend. There are no refunds for shortened stays. Group Reservations of 2 rooms or more: All deposits are non-refundable and cancellations are only accepted more than 30 days before arrival. Aurora Inn, Mirbeau, Sherwood Inn, Lasca's Italian Restaurant, Elderberry Pond, Joelle's French Bistro., 1820's House.., Moro's Table.. The dates this property will honor the certificate are November-April, except holidays/holiday weekends, subject to availability, not valid with any other gift card, certificate, promo or offer. The first time I made and served these my gluten sensitive guests said, "Prize winning! Heaven! The best I ever had." 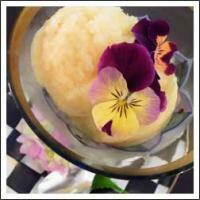 This is a wonderful, refreshing summertime treat that we serve as a first course. 10 Fitch B&B is a wonderful place and memory for us. We spent our 35th anniversary at the Inn. The rooms, bed, home, gardens, food, and care provided by Cheryl & Sally were outstanding! I'd come back again and again! I brought my fiance here for his 50th Birthday celebration and 10 Fitch completely exceeded our expectations. We stayed in the English Suite and it was as beautiful as all the reviewers has posted. From the King size bed with the lavender smelling sheets and fireplace to the oversize soaking tube and the European shower and not to forget all the Mackenzie Child pieces throughout our room and the Inn's common areas. Cheryl and Sally's exceptional cooking skills delivered us gourmet style breakfast each morning of our stay and had us wanting more. The elaborate gardens, koi pounds and gazebo added a nice retreat for some quiet time. I definitely recommend staying at 10 Fitch whether you are visiting Auburn, NY or want to visit Skaneatekes Lake which is only 10 minutes away. We hope to make a return trip to 10 Fitch in the future. My husband and I stayed at 10 Fitch Inn for our 10th anniversary. We live nearby and didn't want to travel far because of our winter weather. We enjoyed everything about our stay. Breakfast was delicious, the bed was super comfortable, the shower was wonderful, and the general atmosphere was cozy and romantic. The night prior to our actual anniversary we went out to dinner and when we came back there were rose petals, candles, candy, romantic music, and our bed was turned down. We could not have asked for better pampering. It was a perfect 10th anniversary. I highly recommend staying at 10 Fitch and we are planning on coming back in the fall and trying another room! I recently had the pleasure of staying at 10 Fitch with my girlfriend for an overnight getaway and all I can say is WOW! The inn is absolutely beautiful and extremely well kept. The common areas are perfect for just relaxing, including the library. The back yard was our favorite spot, though. The landscaping is just perfect and the deck is huge. There are 2 Koi ponds and a gazebo in the back yard which were awesome to explore and just gaze at. We especially loved the waterfalls at the Koi ponds. At night we were able to see many fireflies which were so cool! Cheryl, her husband Rodney, and Cheryl�s mother Sally were SO hospitable; we felt like we were special guests in someone�s beautiful home! They greeted us after we arrived and assisted in helping us get to our dinner reservation by the lake. Since we were the only couple staying at the inn that night we felt like we had the whole inn to ourselves! There are plenty of snacks which was such a nice touch. There was also homemade mint & cucumber water in the parlor which we thoroughly enjoyed along with Sally�s homemade cookies (delicious!!!!). The attention to detail that Cheryl put forth for our stay was simply amazing from the customized white board at breakfast right down to the turn down service with chocolates for each of us. 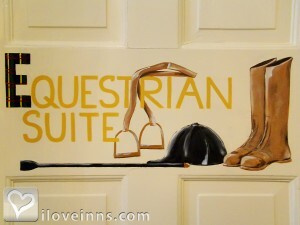 We stayed in the Equestrian room and it was breathtaking! The seating area was perfect with a fireplace, comfortable couch and chairs, and a hide-away TV (with an extensive collection of movies right outside of our door). We picked a movie from the collection and watched it before going to sleep. The bathroom was just perfect, too. It had a wonderful bathtub with jets and this heavenly bath oil and salts for our use. There was also a separate shower with a European waterfall showerhead which was awesome. Aside from the absolute beauty of the whole room, it was impeccably clean and perfectly maintained! The bedroom had a bed which I can�t even put into words. It was hands down the MOST comfortable bed I have ever slept in. And the sheets were so soft and perfect that we almost bought a set when we checked out! The room was air conditioned and super comfortable. We would have loved to just spend an entire day and evening right in the room but there was so much to see and do around the inn. Another awesome, personal touch was the card in our room with the turndown service which had the next day�s weather forecast. Breakfast was out of this world! We had fresh orange juice (served in a beautiful Mackenzie-Childs pitcher), fresh coffee, a decadent watermelon fruit cup with mint and lime, and a mouth-watering dish consisting of skillet poached eggs with green onion oil, prosciutto, and arugula on cheese toast along with sunrise tomatoes. 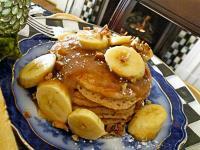 That was the most delicious breakfast that I�ve ever had. Before we checked out, Cheryl was so kind to show us the other suites at the inn and they were just as beautiful as the suite we stayed in. I just can�t say enough about the hospitality and attention to detail at this inn; it�s something that you must experience. We will undoubtedly return to 10Fitch time and time again!!!! 10 Fitch is top of the line and sets the bar high for other BnBs to emulate. We loved everything about the place and their packages they offered. We did the pampered package and it was terrific and made it so easy. The Inn is spotless and all three rooms wonderfully appointed!! Breakfasts were fabulous and served with unbelievable presentations!! Absolutely will be back and I promise you you will not be disappointed in anything. As newly weds my husband and I loved the romantic and relaxing feel of 10 Fitch. We also loved the attention from the Inn, including romantic turn downs, and delicious breakfasts! We also loved the private, home away from home feel of 10 Fitch! A beautiful and Romantic getaway. The owners are warm and acommodating and the romantic gourmet breakfast in bed was heavenly. The rooms are spacious and decorated in old world grand style elegance. The views of the perfectly landscaped yard and gardens from our room were like peeking into paradise. This Inn should be called the Little Gem of the Finger Lakes. After celebrating our 15th anniversary at 10 Fitch in January, my wife and I could not wait to return. We finally had a few days to escape and we were thrilled to be back. It truly is a romantic retreat. The English Suite was once again our home away from home and was spotlessly claen and incredibly comfy. This visit was twice as nice since, not only did we see our friend Sally, we had the pleasure of meeting Cheryl. They both took great care of us and started each morning off right with a variety of fantastic breakfast specialties. We continue to wholeheartedly recommend 10 Fitch to anyone looking for an unforgettable experience. The Most Romantic Bed & Breakfast! This was the best and most romantic bed and breakfast that I have ever been at. I loved the room, the inn keeper and the food. I will not stay anywhere else when visiting the finger lakes. Our stay at 10 Fitch was so relaxing and the place made such an impression on us that we're returning in May for our anniversary!! Cheryl was extremely hospitable and made us feel right at home. Don't think twice about staying at this B&B...try it and I bet you'll be back again and again! As always it was a beautiful experience and our son and his bride get a romantic 2 day get away for their honeymoon there also as our gift to them. Beautiful, tranquil, pampering, immaculate, comfortable, private, charming, delicious food, attention to detail, delightful and informative host. The chocolate turn down service in itself was such a nice touch- unmatched by other B&Bs. Romantic music lightly playing in the background via the ipod dock station, the snacks and tea- Sally thought of everything...This place is superb- the breakfast was served outside on the patio at our request, everything impeccable. We would DEFINITELY stay here again- and try the English Suite next time. The Equestrian Suite was EXCELLENT. What an escape, and across street from cemetary- no hustle and bustle here- just a relaxing ans decadent escape. Well done!! My wife and I spent an awesome 3 days at 10 Fitch and found it to be the perfect romantic getaway for our 10th wedding anniversary. Cheryl is a fantastics inn keeper and made sure every detail of our visit of perfect. 10 Fitch was not only the most beautiful b&b we've ever stayed, it was also the best breakfast and the attention to detail is first class all the way. I'm a clean freak and this house was perfect in every way. The decor, hospitality, and privacy were outstanding. Can't wait to go back! Beautiful setting inside & out. This is the perfect place for a romantic weekend getaway. They cater to your every need. A lovely room and great attention to detail from the innkeeper. We took advantage of the picnic for two in the beautifully landscaped backyard and enjoyed the p&q as well as a lovely and tasty food presentation. A gem in the Finger Lakes area. you will not find another Inn that surpasses it's photos and delivers beyond your expectations! 10 Fitch a 10+ in every category. This is a must experience. You will leave wanting to return again and again. It is magic! What a fantastic inn! We can't say enough about the wonderful service, amenities and especially Sally and Cheryl who made it all extra special. From the wonderful homemade annimversary card to the rose petals and chocolates - it was all fabulous. We are looking forward to another stay! Cheryl made our stay so comfortable and welcoming. We can't wait to go back! The amenities in the rooms are exactly what a person needs and more. Love this place! This is truly a lovely inn with attentive staff and all the amenities you could want. We spent our 35th wedding anniversary at 10 Fitch. It's a fabulous place to stay. The attention to the little details makes you never want to leave. My new bride and I arrived at 10 Fitch, and never wanted to leave. The bed was a gorgeous king sleigh bed, the linens were so soft, and the whole 3-room suite was the most luxurious we had ever seen. And from the rose petal turndown to the personal notes and decorations, Cheryl and Sally (the innkeepers) thought of everything! We will be back for as many anniversaries as possible! 10 Fitch is just a fabulous place for that special romantic getaway. It's very close to two of the Finger Lakes, plenty of things to explore within minutes and the rooms are delightful. Cheryl and her mom, Sally, just make you feel welcome from the moment you walk in the door. The personal touches each night are over the top and the breakfast is delicious. By far, the best innkeeper and B&B I've ever stayed at. Try adding a couples massage to one of your days. Cheryl handled all of the arrangements and it was awesome. Try them out, you won't be disappointed. If you want all the subtle touches of elegance, gracious warmth, special attention and romance -go here! A woderful experience,We are sending our son here for his honeymoon. Cheryl and Sally have created a treasure. The inn combined with their excellent service and hospitality was simply wonderful. From the moment I called to make two reservations, one for my Mom and one for my husband and me, I was impressed with the service we received from that point on. When we arrived Cheryl greeted us and gave us a personal tour/orientation to the inn. The rooms we had, Garden Suite for my Mom and English Suite for us were both truly amazing. The beds were so comfortable, I slept better then I do at home, the sheets were glorious and the bathroom in English Suite is a dream. "Mom's Chocolate Chip Cookies" made by Sally were scrumptious along with their herbal tea selection were a perfect evening snack. We ate dinner at the Sherwood Inn, which as my Mom put it "the best meal I have had in years" For breakfast the next morning was amazing. Sally made strawberry smoothies and waffles with fresh fruit and chicken sausages. It was also a nice treat to be served breakfast so formally, so many inns just have a buffet or side table with food on it to pick from; this was a nice change of pace. My only regret was that we only could stay the one night, we will be back, soon I hope!!! The other activities we did were visiting the Harriet Tubman House and then wine tasting, overall for a one night trip it was one of the best getaways we have been on and the majority of that opinion is because of the wonderful stay we had at 10 Fitch. A friend and I stayed one night and we can't express how wonderful of a time we had. We stayed in the English room, and we felt like royalty staying in a palace. The room was so clean, relaxing, and comfortable. Cheryl and Sally treated us like family. This was our first experience in a bed and breakfast, and the experience was wonderful. We will be back!! 10 Fitch was our first experience at a bed and breakfast. It was beautiful! The innkeepers were very helpful and the accommodations were extremely comfortable and relaxing. Every detail was attended to. We felt pampered the whole time we were there! This is a place I would recommend to everyone. Especially if you are looking for a romantic getaway. The extra packages that are offered are definitely worth the price. The Enchanted Evening package really allowed us to reconnect on our 24th anniversary! Excellent place for the perfect romantic getaway weekend. Very nice environment around the hotel. The Inn keepers are eager to make sure you are having a perfect stay. Neatly decorated rooms and excellent food. The mattress is a little bit too soft though. Besides that, there are very nice little details everywhere. I would recommend it and will definitely stay there again. My wife and I just celebrated our 15th anniversary at 10 Fitch. We could not have been happier. From the moment we got there, we forgot all about our regular hectic lives and just relaxed. The luxurious English Suite was impeccably decorated, our bed was incredibly comfortable and we felt like we were in another world. Sally took care of every detail of our stay, from turndown service with some special anniversary touches to an amazing breakfast every morning. We only regret that we couldn't stay there and be pampered for a few more days. We will definitely be returning to enjoy 10 Fitch again! My boyfriend and I had an extemely relaxing and romantic stay at 10 Fitch. We have already made reservations to come stay in another one of their beautiful suites. The innkeepers are extremely welcoming and made us feel right at home. I highly recommend the ensuite breakfast in the morning! We had a wonderful time at 10 Fitch. Cheryl, the innkeeper, goes above and beyond to make your stay enjoyable. It was the perfect getaway. The quality of the accommodation is astounding, the warm welcome by the innkeeper is truly memorable. We stayed at 10 Fitch as part of a romantic tour of New England and this was the best accommodation of the tour. Truly superb. Best Romantic getaway place for us! My wife & I love the 10 Fitch on how friendly the staff was and how they keep the time you spend there about you even with other guests staying there. We have stayed at many bed and breakfast inns but 10 Fitch definitely adds detail, style and extra touches. We admired the decor with many dashes and splashes of McKenzie Child. We had fun parking our yellow Corvette in front of 10 Fitch and taking a picture of this beautiful home. Enjoyed tea in the living room and ate too many yummy cookies. Upon entering our room we found a chocolate candy bar on our pillow. We have all seen this before but not a picture of our beautiful room on the candy wrapper and our names on the wrapper welcoming us. The rooms are decorated to the nines. The hospitality of this family owned home was outstanding. We are coming back to stay at 10 Fitch again soon. Nice and cozy property. Friendly innkeepers. Good food. Our stay last fall was wonderful in every way. Cheryl and her mother, Sally are excellent hosts as well as warm and friendly. The rooms were immaculate and very well appointed and so comfortable. Our breakfasts were delicious with very generous portions. The home was inviting and beautifully decorated with unique decorations. The gardens looked fabulous, however due to inclement weather we were not able to enjoy them. In all, the property and our visit exceeded our expectations. 10 Fitch is an amazing Inn. If you want true beauty and romance I highly recommend 10 Fitch. My husband and I stayed at 10 Fitch for a weekend in November. All I can say is that it was so romantic and relaxing. You are surrounded in a very quiet area. We stayed in the English Suite. The room was amazing. We had our own sitting area and fireplace. When you're at 10 Fitch you feel like you have the entire house to yourself. You have the option of going downstairs and having a tea with homemade cookies or sitting in the library. You can do some romantic getaways like going to the local wineries or have a massage in your room. Overall I highly recommend 10 Fitch. It is a truly romantic place. Cheryl, the owner, is a very warm, friendly person. And she makes such great breakfast. Each morning you will have something different. Our stay at 10 Fitch was the most romantic Inn that we have stayed at so far. Every year our two daughters give us a B&B gift certificate for Christmas and we have been all over New England, from Pa. to Vermont and 10 Fitch's accomendations were superior in all aspects. Every detail was taken care of to beautiful music playing to the most comfortable bed and lovely rain shower. We couldn't have been more pleased with our stay and of course, the chocolate chip cookies were to die for. You can even love alone at 10 Fitch. The nights I spent at 10 Fitch I was alone, however I fell in love. The scrumptious breakfast was served at the window onto the outback yard. I fell in love... with the sunken garden of yesteryear and the wide variety of manicured plantings. I can still feel the calm of the view and the feel of the fresh morning air wafting through the open door. I fell in love and best of all I can go back anytime I wish..in my mind. We stayed there for our honeymoon and 1st anniversary. It's a very special place for us, the decoration are so beautiful and the services are incomparable. We love it, and will definitely go back in the future. My husband and I stayed at 10 Fitch for our 10th wedding anniversary. Upon returning to the inn that evening, we were very surprised to find our entire room lit with candles. There was soft music playing and rose petals were scattered on our bed. We were amazed at the extent to which the staff went to make our anniversary so special! All you have to do is look at the web site to know if you want a romantic weekend, 10 Fitch is it! We stayed in the English Suite. The bedroom was perfect. The sheets were the best of any place we've ever stayed. I would highly recommend 10 Fitch for any special event in your life! We had a wonderful weekend at 10 Fitch. From arrival to farewell it was a lovely experience. Our suite was beautiful with every attention to detail. Robes, towels, bedding all top quality. The inn-keepers fantastic, outstanding breakfast, and turn down service. We could not have asked for a more romantic weekend get-away in celebration of our anniversary! My husband and I went to the Finger Lakes for our honeymoon. A lot of the southern end luxury B&Bs and nicer hotels had already been booked 3 months out. Came to find out there were a lot of festivals that weekend. This led me to look a little north of where I expected to be and I found 10 Fitch. That is the ONLY reason I have the location less than excellent as I had anticipated being right in the middle of wine country originally. But Auburn is a charming town and only a short drive to the wineries. 10 Fitch partners with a tour company that provided us with excellent service in a private car to the wineries of our choice. We wanted a more luxurious experience and I could see from their website that the suite features, amenities and other add-ons (in room dining, massages, picnic baskets for lunch) would provide us with what we were looking for. So many B&Bs look like your Aunt Sally's spare room - not 10 Fitch! The bed was amazing, sooo comfortable and all the little extra touches provided, surprises and yummy food made us feel spoiled. I had the pleasure of staying in the Equestrian Suite for 2 nights in July 2009. Though the website does an outstanding job in displaying the property, to see it in person is amazing. Every last detail is exquisite, the breakfast phenomenal, and the innkeepers Cheryl and her mom, Sally, are warm, friendly and so very accommodating. The house and the backyard gardens, trees, and koi pond are enchanting. I stayed here alone but can't wait to get back there from CA and have a romantic getaway! I've stayed at many inns and b&bs through the years, and 10 Fitch is by far my alltime favorite!!! We decided to spend our honeymoon at 10 Fitch about 6 months before the wedding. We happened upon their website and were immediately excited. It looked perfect! It was perfect! Every detail was outstanding. Cheryl and Sally are wonderful hosts and are passionate about what they do and it shows. Right down to the personalized treat! We would stay here again and again. It was the perfect place to spend a honeymoon. The English Suite is very private and every bit as beautiful as it looks from the pictures.. wait until you see the bathroom in real life....it's stunning! All of the suites are stunning though so you can't really go wrong with any of them. This was such a lovely, romantic inn; we thoroughly enjoyed the accomodations, the ambience, the grounds were beautiful, and in a peaceful setting. The breakfast was splendid, and the inn keeper was very attentive, and added her warmth to our stay. They really made it such a personal experience! My wife & I have stayed at numerous inns over the last 40 years. This one is truly one of the best. Cheryl & Sally are the most gracious inn keepers ever. They made us 'one of the family' for our stay and treated us like royalty. Our anniversery was made truly special. Clean, luxurious, great food. There is nothing the innkeeper forgot in making our stay so memorable! Celebrating 40 this year with 8 friends at this perfect Inn went so far beyond my expectations. The following excerpts from my diary entry left @ 10 Fitch says it all! "The word �accommodations� will forever be changed in scope and meaning thanks to Cheryl and Sally bestowing hospitality par excellence." "10 Fitch�s unsurpassed attention to detail." "Fresh flowers, lush gardens, and a Bed & Breakfast no decorator could match were weaved into a braid of genuine warmth, colorful original designs, and supreme comfort." "Indoor and outdoor backdrops alike are nothing short of paintings come to life rivaled only by the culinary creations that were dressed to the nines for every meal." 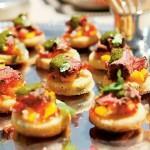 "From dinner at Lasca�s to shopping in Skaneateles (pronounced �skinny atlas�); from inventive hors d�oeuvres to bone melting massages, and don�t forget about the cozy fire pit. From never-ending smiles at breakfast to the pinnacle of a 6-hour limo tour courtesy of Sam�s knowledgeable friendliness. First there was Mackenzie-Childs with the house that imagination built, then a picnic with a variety of tasteful treats; Long Point and King Ferry wineries tickling our taste buds, and the last stop at Taughannock Falls burning breathtaking images on our thirsty retinas." "On the eve of our departure, Cheryl and Sally took great care to celebrate all of our 4 decades with festive decorations, a really scrumptious cookout, and a thoughtful gift." I can't wait to return with a special someone because the setting for romance is truly gorgeously laid out for every couple to enjoy. 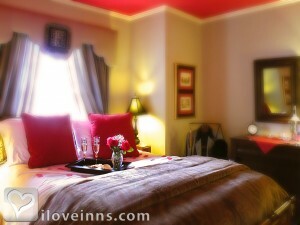 I wanted to surprise my wife with a romantic weekend away and I found it at the 10 Fitch Inn. Boy was she surprised! The Inn was flawless and Cheryl and her mom Sally was terrific. Everything was just as I planned from there website and for a romantic getaway it was exactly what we needed. The turndown with the rose petals and teddy bear really kept the romance flowing. Staying at the 10 Fitch Inn again is definately in our near future!! Romantic doesn't begin to describe! This romantic, beautiful Inn is the perfect spot for a getaway with that "special someone." The overall experience definitely met our standards (which could be called very high). Our stay was quiet, romantic and private. Extra special touches like chocolate and silk rose petal turn down service, i-pods with romantic playlists, remote control fireplace and luxurious linens are what set this apart from other B& B's!! This place is awesome and your FOOLISH to choose or even think about going anywhere else. Cheryl and Sally are nothing short of awesome. My girlfriend said to me "they are made for this"
I stayed at the 10 Fitch for two nights in the English Suite and it was absolutely perfect. It was romantic, private, and only ~15 min from Skaneateles. They have lots of great options to add to your stay that really make it special and they are very detail-oriented. We had breakfast in our room each morning and it was incredibly delicious. I proposed to my girlfriend that weekend and she said she couldn't imagine it any better. We're planning to stay there for our wedding night as well. I highly recommend this to anyone looking for a nice getaway. I had looked at other places, including the Mirbeau, and I thought the 10 Fitch was better. I still made it to Mirbeau for dinner and the spa, but their rooms did not look as nice as the 10 Fitch. Check out the Skaneateles Bakery on Jordan for some great food and sweets. The staff is friendly and the place is clean. It is my favorite place to get eats and treats in Skaneateles. We absolutely enjoyed our recent stay at 10 Fitch in Auburn, New York! The Finger Lakes Region is so beautiful in the Fall. 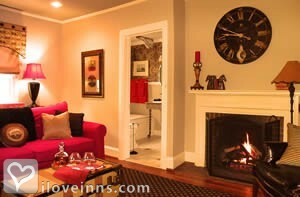 We loved our romantic 1-bedroom suite at 10 Fitch, with beautiful bed linens and fireplace. We were so warmly welcomed to this romantic spot by Cheryl Barber, the Innkeeper. Each night, after our return from a local restaurant, Cheryl would have the fireplace lit in our bedroom suite. She had remembered that we loved returning to a glowing fire, along with a piece of chocolate on top of our pillows each night. How divine and perfectly romantic! We can't wait to go back! We loved the whole experience and will always remember 10 Fitch as a great, romantic get-away. I came across 10 Fitch while looking for a place to take my wife for our two year wedding anniversary and to celebrate the birth of our first son. It couldn�t have been a better choice. We had the most romantic stay while we toured the Finger Lakes wine country. The room was absolutely beautiful. We sipped local wine by the fire prepared for us by the inn keepers. We felt as if we were staying at a five star resort with all the intimacy of a private luxury suite. To sum up the two night stay in one statement, my wife told me, �this is the most romantic time I�ve ever had sweetie! I don�t want to leave.� And we honeymooned in Hawaii. A truly romantic luxurious discovery on our trip back home to Pittsburgh from Massachusetts. The kindness and surroundings made it one of our nicest stays. Beautiful Inn with wonderful ambiance. Everything was so inviting and very romantic. My husband and I had a lovely romantic overnight at 10 Fitch. Everything was perfect. The inn is the ultimate for romance with a firplace, clawfoot tub, private balcony which peeps out through the trees onto an immaculate lawn. It's cozy and feels as though you've entered a private place. We stayed at 10 Fitch for our 27th anniversary (May) and were enchanted from the moment we arrived. Even just the decor is a feast for the eyes. Our lovely and spacious room overlooked the back garden from our private balcony, and the sound of the little waterfall in the garden pond was soothing (we'd both escaped the stress and rigors of jobs to take this few days off). Our hosts were gracious and entertaining and we shared good conversation and laughs. The meals were exquisite. A lovely, romantic, memorable stay. What a fabulous place. Very..Very Very...romantic. everything about 10 Fitch is amazing. I HIGHLY recommend everyone to spend a night/two or three.. Its wonderful. We stayed two nights and wish it was more. we will be returning every year! My husband and I stayed at 10 Fitch in June 2008 to celebrate our 10 year wedding anniversary. We stayed in the English Suite which was a large 3 room suite. It was beautifully appointed. The large bedroom consisted of a king sized bed in front of a working fireplace and access to a private balcony. The bathroom was huge with with a claw foot soaking tub and also a large shower. There is also a small sitting room with a TV and refrigerator. Upon returning from dinner, we found the entire bedroom lite with candles (battery-operated), rose petals strewn on the bed, soft music playing, chocolates on our pillow and a helium filled "Happy Anniversary" balloon tied to a chocolate bar with our names and a picture of the inn imprinted on the wrapper. It was so unexpected and so very romantic. I would highly recommend 10 Fitch to anyone looking for either a romantic or relaxing getaway. I know my husband and I will definately visit there again. We were only able to stay one night at 10 Fitch but it was the epitome of relaxation, privacy, comfort and coziness. Our room was dreamy, especially the country bathroom and private TV lounge! From chilling our wine to turning on our fireplace before we made it home from dinner to our exit care package of homemade cookies, this was a truly special post Christmas decompression retreat. Whether in a group or as couples, the location and upkeep of this chalet is unparalleled... offering serenity while still being close to amenities. The service and quality of breakfast only add to it. We had the pleasure of staying at 10 Fitch. The atmosphere was so romantic and lovely, that we will stay there again when we visit the finger lakes region again. The inn keepers were very pleasant and enjoyable. 10 Fitch is in my opinion, first class. We spent our honeymoon at 10 Fitch. The owners made it so special for us from placing rose petals on our bed to fixing us a picnic lunch which we ate in our room as we just wanted to stay there. We had the best room in the house and the little extra it cost us was well worth it! 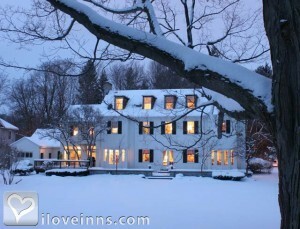 The 10 Fitch Inn is beautifully decorated, luxurious, romantic, and in a stunning location right on Lake Cayuga. The staff were helpful and friendly. I wish we could have stayed longer! The 10 Fitch house was so warm and inviting from the moment we walked through the door. Our room was so beautiful and romantic. The lighting was a perfect mood setter. Breakfast in our room was not only delicious but the perfect way to spend some quiet time together. I took my boyfriend to 10 Fitch Inn for his birthday two Decembers ago. I've stayed at my share of Finger Lakes B & B's and am very particular. By far and away 10 Fitch Inn was the most romantic getaway I have ever had. The Equestrian styled room we stayed in was lovely, from the wood burning fire place to the feather topped bed-just outstanding. The next B & B reservation I make would be to 10 Fitch Inn! We had a wonderful weekend at 10 Fitch. 10 Fitch is a very romantic place. The rooms are first rate and the the owners are great. My husband and I could not take a long honeymoon right after our wedding. My family surprised us with a stay at 10 Fitch as a 'mini-moon' The inn-keepers, Cheryl and Sally made our stay so memorable and very romantic. We had a wonderful time even though we were only a few hours from home. What a lovely place to escape to. Our breakfasts were wonderful as was our picnic dinner. Could not have possibly had a more relaxing, romantic stay!!! A great place to get away. The owners were great hosts. So cozy and romantic, breakfast in bed, and the bathroom with the clawfoot tub and rainforest shower was amazing, we will be going back and would recommended to anyone who needs time away with the one they love. I give 10 Fitch 10 Stars! We had a wonderful stay. I was there for the night before my wedding and the night of and I can't even begin to tell you how amazing it was. All the special touches made this the one of the best memories of my wedding. From the moment we got there we knew we chose the right place. Our hosts were very friendly and took care of our every need. Detail was impeccable and really made our anniversary more romantic. I don't think I will stay any where else when I visit the finger lakes again. Beautiful work!! My husband and I had a very romantic honeymoon at 10 Fitch. Each night we purchased a bottle of wine from downstairs and return to our gorgeous room that was furnished with fresh flowers, candlelight, and romantic music. My husband and I spent our first weekend away from our Children at the 10 Fitch Inn. Our 3-room suite had a fireplace in the bedroom, small balcony, spacious bathroom with an old English tub and open shower plus a sitting room. They delivered strawberries and champagne the first night. They also assisted us with renting a Town Car and driver so we could enjoy visits to the wineries. It was a wonderful, relaxing, romantic weekend that I hope we will get to do again. We stayed there for four days during our honeymoon trip. It made our experience so pleasant and romantic. We highly recommend 10 Fitch for newlywed or any couple who would like to getaway for few days. Love it! This was the best and most romantic time together we have had in years.They went way beyond for our 25th Anv. A great mix American History and luxurious comfort. I always remember 10 Fitch. Wonderful Spa Restaurant close by. A wonderful find. We stayed for our anniversary. From the moment we walked in we felt so comfortable. Then when we saw our room it was so romantic. Huge open shower, fireplace in the bedroom, beautiful four poster bed....so cozy. We didn't want to leave. My wife and I visited 10 Fitch in April 2008 and we couldn't have been more pleased. It was our 13th wedding anniversary and we just wanted to stay low key and enjoy ourselves. We ate dinner in nearby Skaneateles and returned to a nice bottle of wine and a beautiful room. We stayed in the Equestrian Suite and the accommodations and service were very nice and discrete. In the morning, we were treated to a wonderful breakfast and great conversation. I hope to include 10 Fitch in future anniversaries. Thanks for a wonderful experience. My husband and I stayed at 10 Fitch for our honeymoon in June 2008. The detail that Cheryl and her mom put in to the care of our stay was absolutely incredible. At 10 Fitch we were not just a "guest" - we were treated like family. Our stay included a 6 hour guided wine tour with a picnic lunch, a four course dinner at Giverny, and an in-suite couples massage. These amenities were put together for us so we did not have to do any of the work. It was truly a relaxing stay. We cannot thank you enough for the memories you created for us! We decided to take a trip to 10 Fitch for our 2nd wedding anniversary - not knowing what to expect...our hopes and expectations were beyond surpassed. My parents called ahead to let the innkeeper know of our anniversary - there was cold champagne and cards waiting for us. When we went out to a great dinner (place recommended by the innkeeper) and came back to a room filled with LED candles chocolate on our pillow - the perfect romantic room. Our needs were anticipated before we even requested. Breakfast could not have been more delicious! The inn, service, company and all of the special details made our stay - and our anniversary phenomenal! The most romantic place on earth! We said our vows at the Inn, and fell "in love" with 10Fitch, we can't wait for our anniversary so we can go back. The innkeepers are an inspiration to love and family. We are honored to meet them. We loved our one night stay in the English suite and made use of every amenity it had to offer. The large clawfoot tub - relaxing, the fireplace - a cozy retreat, the extra large king size bed - heavenly. And we still managed to escape and tour the Skaneateles area for dinner. We slept in, which is such a treat. And breakfast was perfect! Leaving was difficult, but will come back, and we hope it will be soon! We searched long and hard for an ideal B&B to spend our honeymoon. 10 Fitch offered a delightful honeymoon package and after an initial call to the Inn owner Cheryl we knew this was the place we were going to book. Cheryl was so pleased to tell us about the Inn and the special honeymoon package and followed up immediately with personalized quote and sample itinerary. Things just got better from there. We were truly treated like royalty and we couldn't have picked a better place to spend our special time. Cheryl and Sally were so personable and friendly and made the experience that much more enjoyable. The inn was impeccable. Clean, unique, cozy, comfortable, delicious food and filled with unique antiques and hand painted furniture both by the owner and with pieces from MacKenzie Childs collection. We arrived to strawberries and champagne, followed by a couples massage. I'd share all the special treats and surprises that awaited us throughout our stay, but I wouldn't want to ruin the surprise for others choosing to stay there. Just know that they take great pride and care in making each surprise personal and unique and we can't tell you how much we appreciated all the special touches. We enjoyed a 6 hr. wine tour with a wonderful driver and came home to the Inn for a delicious picnic dinner in our room. Cheryl's home-made chicken soup was absolutely the best soup we've ever enjoyed. Home made cookies, assortment of teas and hot cocoa available at any time during the day perfect for when returning from a walk, a day shopping or just getting cozy in the evenings. The room was amazing! Cozy, clean and the beds were so comfortable you just never wanted to get up in the morning. We really can't say enough about this wonderful place and the innkeepers. They have created a wonderfully romantic place to enjoy. We will definitely go back again for an anniversary. They have so many other wonderful packages to chose from as well. This is definitely a place to visit. My boyfriend of 3 years surprised me with a trip to New York to tour wineries along the Fingerlakes for Christmas last year. It was our first trip together and the wonderful staff at the 10 Fitch made it more romantic and special than I could have hoped for. Their knowledge of the winery tours and familiarity of our driver made the trip hassle-free and completely enjoyable. They were so accommodating and made our romantic getaway a special memory we will cherish forever. Last year I and my now fiancee, Salomea, spent a couple days in Auburn at 10 Fitch and the accomodations and service were exceptional. I am not great with words but I would recommend 10 Fitch to anyone looking to "get away" with their significant other. We had an incredibly wonderful overnight at 10 Fitch. Everything was perfect..from our room to the food to the very accommodating owners! We would gladly return. Actually we will return sometime soon! Two years ago, I spent two nights with my husband at 10 Fitch. It was my birthday, and we were in town for a family wedding. We cuddled by the fire, drank wine, and had a long bubble bath. The staff was wonderful and accomodating, we were coming in late from Chicago and they left us a key. The food was wonderful, and everything was sparkling clean. My two nights at 10 Fitch is still my "happy place" that I like to think about when things are stressful in my life, and I really wish it was so much closer to where we live. I look forward to the time I can come again, and to spending another romantic, lovely few nights within the walls. 10 Fitch was not only relaxing, but welcoming. With the amazing linens, to the most beautiful bedrooms and bathrooms i have ever seen. The food was great and the whole stay was amazing. If you are looking for a place to be relaxing, comforting, and with lots to see, including a beautiful lake only ten miles away. I would put 10 fitch at the top of your list! 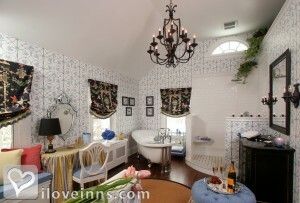 We loved every detail of 10 Fitch -- both inside our suite and around the inn itself. The bed was a dream, the various other amenities were amazing and helpful, and the breakfast in the morning was exquisite. There is nothing more you could possibly ask for, and likewise there was nothing about the stay we didn't like! Looking for time away to really connect and be alone - we decided to celebrate my birthday and our anniversary at 10 Fitch. Cheryl welcomed us warmly and helped us feel relaxed right away. 10 Fitch is beautiful but not stuffy - elegant yet very comfortable. We stayed in the English Suite. Every bit of it was beautiful, inviting and very clean! The breakfasts were amazing - filling, delicious and everything was so pretty. Our entire stay was more than we hoped for and we are looking forward to another visit! My boyfriend and I stayed at 10 Fitch for our one year anniversary. We found 10 Fitch through a general B & B search online � the 10 Fitch website along with the pictures and descriptions are what sold us to book our stay! We were hesitant at first because it was our first stay ever at a B & B; however, we took the plunge and 10 Fitch FAR exceeded our expectations! Not only did I enjoy it, but my boyfriend did as well, and coming from a man you know this is a big deal!! ;-) Every detail about 10 Fitch was absolutely perfect. Cheryl (the innkeeper) was ALWAYS helpful if we had any questions regarding the excursions we went on or where to go for dinner. My boyfriend and I felt very comfortable throughout our stay. The house is gorgeous � very well maintained, incredibly clean, decorated beautifully, and has such great character. The outside of the house was just as enjoyable! The chocolates on our pillow at night were a DEFINITE plus. =) It was the perfect place for my boyfriend and me to spend a special and romantic weekend. Thank you Cheryl and 10 Fitch for helping us to create such amazing memories! What an absolutely fantastic experience! My wife and I can't wait to make a return trip. The rooms were above and beyond what one imagines from looking at the pictures. Cheryl was a friendly and warm person who made out stay even more enjoyable. The food was superb. My wife and I stayed at 10 Fitch for a mini honeymoon right after our wedding. We couldn't have picked a more romantic setting. We stayed in the English suite, with a large four-post bed, private balcony, sitting room, and a claw-foot tub and rain shower with room for two. Cheryl and her husband went out of their way to make us feel at home and relaxed after weeks of wedding planning. Cheryl's breakfast, served in the suite, was out of this world, and the candle light, rose peddles on the bed, chocolate on the dresser, and romantic music playing when we got back to the room at night were the personal touches that set 10 Fitch apart from any Bed & Breakfast we stayed at in the past. We look forward to returning for our anniversary. This was the most romantic place in which my husband and I have ever stayed. 10 Fitch was perfect: the rooms were incredibly comfortable, clean and luxurious. Cheryl provided everything that we thought we needed and more. The inn is impeccably decorated, and you have to see the yard! We usually don't go back to the same place twice, but we are already planning our return trip to 10 Fitch! This lovely 3 suite inn is the perfect romantic getaway. We stayed in the equestrian room and requested the chocolate turn-down service. The room was exquisite when we entered with rose petals strewn on the bed, romantic music playing, the most sensuous spa sheets on the bed, candles everywhere, and of course chocolate. It was just heavenly! We would stay here again in a heartbeat. Proprietors Cheryl and Sally are lovely people and wonderful cooks. Although we live in the Finger Lakes region, my husband and I knew that a much-needed escape was what we truly required to regroup after a series of difficult family and business issues. The minute we checked in to the Garden Suite we immediately knew that we we would be returning for more than the 1 night get-away we booked. We dined an at one of the many exceptional area restaurants that the owners recommed on their website, and returned to a place of romantic beauty, serenity, and peacefulness that is beyond description. The home cooked breakfast prepared and served by the owners was just incredible, incorporating the abundance of the Finger Lake recent harvest. Treat yourself to a romantic weekend - whether if it's just for you to get away alone, or to share with your 'honey'. 10 Fitch is THE place! Celebrating 32 years together, my husband & I stayed for one 'Enchanted Evening', full with a couples massage, cheese fondue & chocolate-dipped strawberries while playing the wonderful board game 'An Enchanting Evening'. This is a game all couples should play every year to reconnect with each other and keep the fire going! We were amazed with the house---which looks better than anything I've seen in "Home & Garden" magazine, each room with it's own magic---and with the excellent personal service, felt like we were specially pampered during our short stay. My husband and I took a trip across NY. We stayed at several B&Bs, but none took our breath away like 10 Fitch. Every last detail was amazing!! The sheets and breakfast pure heaven. If you want to feel like a King & Queen, you must stay at this B&B. We can't wait to go again! Marsha & Steven G.
10 Fitch is a MUST do. Whether you travel 1 hour or one day to get there, you will be so pleased that this is the Inn that you chose to stay in. 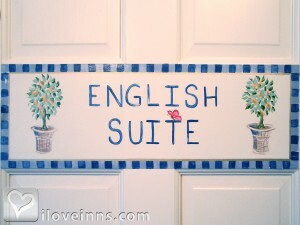 The English Suite is ...spectacular! The bed is regal and has the most wonderful sheets in the world - comfy just hints at the experience. The bathroom is elegant and lovely enough to make you want to enjoy each nook and cranny; along with teh wonderful soaps, towels, open shower. The sitting room is so relaxing and comfortable. The common rooms are beautiful, inviting, welcoming and have just the right mix of everything, to include lovely pieces from Mackensie Childs. And, breakfast was delicious and delightful; served in a room filled with beautiful plants and light. Although we visited during winter, the view out to the gazebo, patios, ponds and gardens only makes me want to book my next stay now! Lovely .... just lovely! Our stay at 10 Fitch was beyond what we could have imagined. It was so romantic and wonderful, they took care of every detail, and made sure we were comfortable. The beautiful room, and the turn down service with the rose pedals and all the candles was the icing on the cake. We stayed at the inn to celebrate a 40th birthday last year at the end of October. We couldn't have picked a better place. Cheryl went above and beyond to help plan our stay and be sure we would be all set. Sally and Trish greeted us and made our stay perfect. The food was excellent. The home was beautiful. The trip was so relaxing and peaceful! We can't wait to come back and stay again. We've been dreaming of the cookies and cheeseburger/macaroni soup ever since! If you are looking for a beautiful and relaxing trip with exceptional service, this is the place to stay. We are looking forward to planning another visit very soon! Cheryl, Sally and Trish thank you for everything! This B&B is a little more expensive and worth it! With her gourmet breakfasts & little touches (10 Fitch memo pad as a gift in room, comfy robes, bath beads, chocolates & fresh baked cookies available all day, fridge in room stocked with water/soda/snacks), Cheryl tries to make everyone feel comfortable. We had never been to the Finger Lakes and found a perfect location. We were able to see much of the area, take a wine tasting tour (complete with an amazing picnic lunch packed by Cheryl), get in room massages, hike to waterfalls and explore the shops and great restaurants. It was a great romantic get-a-way!" We were at the Inn last week and enjoyed our stay very much. We have have stayed at B&B's for over 20 years and this one is by far one of the best if not THE best! The Most Relaxing Getaway in YEARS! My husband and I stayed here this past weekend to celebrate our 1st wedding anniversary, and what an amazing place! Cheryl & Rodney are amazing people...warm, friendly and very hospitable. We felt right at home the entire time we were there...it was just too short of a stay in my opinion...we can't wait to go back...I have to admit this was the most relaxing weekend I have had in years! We absolutely loved it! The house is stunning and very tastefully decorated, the food was just superb, and the service....there aren't enough adjectives to describe the service. This was the perfect getaway for us and can't wait to visit again...love the area, love the house, and our Inn Keepers! Thank you so much for making it wonderful for us. The ambience in this inn is out-of-this-world. We felt so at peace while we were there. Our accomodations were spacious, comfortable, and supplied with all the necessities including soft drinks, homemade cookies and other snacks. The Innkeeper was friendly and prepared wonderful food. We were treated like family rather than guests. We had a wonderful Romantic stay at l0 Fitch. Our suite was very beautiful and comfortable. The food was outstanding. We,also, thoroughly enjoyed the home and beautifully landscaped gardens. l0 Fitch is so welcoming and felt at home immediately. They have set a new standard for us in terms of what to expect in B and B's. It is truly outstanding. We had an amazing romantic weekend at Fitch B&B in Auburn, NY. Our Host Cheryl left no stone unturned and paid attention to every little detail. This was a truly wonderful get away celebrating my husbands 40th birthday. The best B&B I ever stayed in. Beautiful surroundings with luxurious rooms that are very clean. The food was outstanding and the innkeepers were warm and friendly. This inn is the most romantic and comfortable inn that we have ever stayed in. 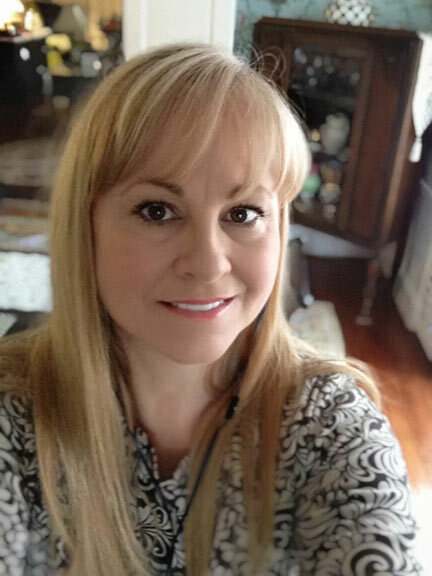 Cheryl, our host has a real talent for attending to every detail and she shares her remarkable home with genuine warmth, and friendship, while maintaining the professionalism to provide a fabulous getaway experience! My boyfriend and I just returned from two amazing nights at 10 Fitch! We had never been to a B&B before and were a little nervous, but Cheryl and her mom, Sally, immediately made us feel welcome and at ease. The property and rooms were beautiful, and everyone was so nice and accommodating. We took advantage of one of the romance packages and were so impressed by every detail. The in room massages were the perfect start to our trip and the candles, music and rose pedals were a nice romantic touch for when we got back from dinner. The next morning we had an absolutely delicious breakfast, followed by a chauffeured wine tour with an equally delicious picnic lunch. Cheryl and Sally were so accommodating of my gluten free needs...I was able to eat all the same things as my boyfriend, just in a very tasty gluten free version. :) I highly recommend 10 Fitch to anyone looking for a relaxing, romantic weekend get-away! The house was beautiful, cozy and the room (we stayed in the English Suite) was incredibly comfortable. We hope to be back again soon! Loved this gorgeous romantic Inn....everything we could have wanted and more!! We will definently visit again! We were in the area for a family wedding and chose an escape for ourselves. Superb accomodations & attention to detail. We stayed in the English Suite and could not have been more comfortable. Gracious innkeepers Cheryl and her Mom, Sally. Lots of TLC! A wonderful area to explore, the area has it all! The most Heavenly, Magical place on earth!! Thank you for many great visits! Nominating for most romantic inn! Impeccable service, delicious food, and such a warm atmosphere. 10 Fitch transports you to a place where everything is cozy and you quite literally leave all your worries back home. Perfect for couples needing a quiet getaway, this is the type of B&B you just don't want to leave! What a peaceful and relaxing romantic inn. We felt right at home, while feeling special and secluded. We can't wait to come back! We stayed at 10 Fitch last October to celebrate the anniversary of when we met. It looked very nice from the website, but it was better than we could have imagined - and all incredibly romantic! The entire first floor of the house is beautifully decorated with antiques, the backyard is very serene and calming, there's always a puzzle to be worked on on the indoor porch, and there are always delicious smells coming from the kitchen. We stayed in the Equestrian Suite - which was perfect. Every night when we would arrive back from dinner or wine excursions the gas fireplace in our room was turned on, the bed was turned down, and little chocolates were on the bed with a card. Oh- and romantic music was playing on the ipod in the room. We both enjoyed lounging in the room in the robes provided for us and played backgammon on the game table in our room. We even loved the toiletries! We found the bath products online and purchased some to use at home so we can always feel as relaxed as we did at 10 Fitch - even if it's only for a few minutes every morning. Our breakfasts every morning were absolutely fabulous. Gourmet is an understatement and we weren't hungry until dinner. We also ordered a picnic basket for one day when we were winery hopping - it was perfect! It was the most delicious butternut squash stew, sandwich wraps, cheese, crackers, grapes, chips - plenty of food! We were never hungry! Cheryl and her mother were the best hosts. They were both so friendly and knowledgeable about the area. And every was spotlessly perfectly clean. It is a top-notch inn with first-rate service. We will definitely go back. I cannot say enough amazing things about 10 Fitch! My husband and I stayed at 10 Fitch for our 2 year anniversary and had a wonderful time. 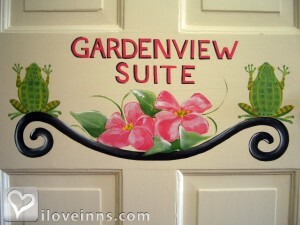 We stayed in the Garden View Room and were pleasantly surprised with how spacious it was. The room was immaculate and Cheryl and Sally made our stay that much better. Cheryl didn't hesitate to answer any questions we had or give us recommendations for things to do in the area. For our anniversary night, Cheryl and Sally decorated the room for us to have a romantic night. It was wonderful. The 10 Fitch Bed and Breakfast Inn was warm and inviting. The house itself is absolutely beautiful from the front door to the gorgeous gardens in back. No detail is spared in the decorating. The Innkeepers are delightful-we especially loved Sally! The breakfast was presented so beautifully and was creative and delicious. Our suite was comfortable and so pleasing. We stayed here for our anniversary. After looking at several inns, we decided on this one because of the wonderful reviews. It lived up to all the reviews. Cheryl was friendly and professional and had several suggestions for us about things to do and see in the area. The room was comfortable and romantic. We left to sight-see and have dinner. When we returned our bed was covered with rose petals, music played in the background and there was a personalized card for us. The breakfast was absolutely wonderful as well. We had a lovely stay at 10 Fitch. The room was above our expectation in comfort. The customer service was far superior than some 5 star hotels I've stayed at. I had some special requests for my stay. Cheryl handled everything with top notch attention! The decor was beautiful and comfortable. Highly recommended! We stayed at 10 Fitch for our wedding night and first night as a married couple, and it was absolutely amazing. The staff were more than accommodating, including letting us take our "first look" wedding pictures outside in the beautiful gardens. When we returned to the room on our wedding night, they had decorated with "just married" signs. The next morning, we ordered the breakfast in our room, and it was a cozy, perfect way to start our married life together. On our second night, we came back to find the room lit with candles and soft music playing. The staff looked out for us each step of the way, never obtrusive but always thinking of guests first. The food at breakfast was delicious, coffee was always available, and the sheets are to die for. We will definitely stay here again for future anniversary celebrations and recommend it to anyone looking for a cozy, private get away. Our trip to 10 Fitch was a gift from our children for our anniversary, Without a doubt, the most romantic and relaxing trip in many years. Just a womderful place to spend some special time together. Cheryl, the inn keeper is magnificent. The inn is gorgeous!! It's nice and quiet great for a quick getaway. The breakfasts are delicious. If you want exceptional personal attention, Cheryl and her mom at 10 Fitch is where you want to be. Breakfast presentation inclusive of their table settings are above any standards and not seen in most B&Bs. If you don't see it, have it or want it, just ask. The inn is perfectly situated for wine touring, balloon rides, dining and theater and history. Having morning coffee sitting b the pond is our favorite. Had a one night stay and felt like I was away for a week. So relaxing. Had take out from nearby Lasca's Restaurant for a fireplace dinner in our room. So romantic. Cheryl and staff were wonderful. Can't wait to go back. Highly recommend! Hands down the best Inn we have ever stayed in. Everything is beyond expectation.inn keepers are friendly and accommodating. Rooms are comfy and clean. Breakfast is gourmet and home is warm and inviting. We would definitely go back!!!! My husband and I visited 10 Fitch inn in early March 2015 and we loved every minute we spent at this wonderful Inn. Cheryl, the innkeeper, was very friendly and provided top notch service. Cheryl thought of every detail to make our stay pleasant. Breakfast was delicious, the bed was super comfy, and the Inn is immaculate. We had a wonderful 2 night stay. Fantastic inn and WONDERFUL hosts!! 10 Fitch is top of the line and sets the bar high for other BnB's to emulate. We loved everything about the place and their packages they offered. We did the pampered package and it was terrific and made it so easy. Cheryl and Susie were like family and treated us great and were always cheerful and smiling. The Inn is spotless and all three rooms wonderfully appointed!! Breakfast meals were fabulous and served with unbelievable presentations!! Absolutely will be back and I promise you you will not be disappointed in anything. A beautiful inn , much attention to detail. Breakfast was wonderful and the inn keeper could not have been nicer! 10 Fitch Inn' s attention to detail is outstanding!! We did a spur of the moment romantic getaway!! When we returned from a fantastic dinner, our suite was bathed in candle light, rose petals on the bed, chocolates, a personal anniversary card, lotions, beautiful music playing, etc. The innkeeper and her assistants were helpful, friendly, and radiated happiness and love. Can't wait to return!! Very Romantic - You will not be disappointed. We stayed here for a belated celebration of our 19th anniversary. The Inn and surroundings are beautiful. Cheryl and Sue were both very friendly and helpful. The breakfasts and a packed lunch (that we took on our wine tour) were both excellent. We booked a package and to say that the attention to detail was amazing does not seem to do it justice. Because everything was taken care of, we were able to relax and enjoy our time together. I highly recommend 10fitch. We hope to return sometime. From the moment you step into 10 Fitch's door until the time you leave, it is a delightful, warm, romantic experience. The rose petaled turn down service was beautiful...one walks into their room with rose petals spread on the bed, chocolates and lavender sachets on the bed, soft love songs playing on the ipod, a welcome note, subtle lighting with candles placed throughout the room and on the fireplace mantle, and a little card giving you details for the next days' weather. The breakfasts are absolutely delicious and enough food where you won't want lunch! Every day/evening, there is bottled water, tea, coffee, hot chocolate, snacks, and fresh baked chocolate chip cookies available. Cheryl and her team are the essence of the inn....thoughtful, kind, informative, and helpful who treat you like family! We only stay at inns when we travel and in my book this is an 'annual repeat!' Highly recommended. April 2011 Prize Package on Wheel Of Fortune.